Joan lives near a volcano in the Philippines. She’s a single mom who sold food to provide for her two small children. She never earned enough. Some days she had to borrow powdered milk “by the scoop” from a neighbor to feed 2- year-old daughter, Zoe. “We count how many scoops I take so I can replace them when I save enough to my own pack,” Joan told CBN. It also difficult when her 8-year-old son, Kurt, outgrew his clothes. “I was playing with my friends when my shorts ripped because they were too small. I was so embarrassed that I quickly sat on the ground,” said Kurt. Then a volcano erupted near their house. Thick ash forced Joan and her family to evacuate to a CBN supported shelter and Joan had to shut down her food business. 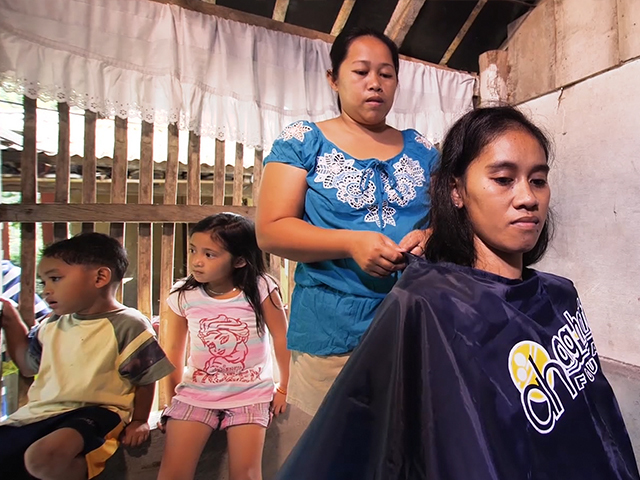 At the shelter, Joan enrolled in a jobs-training program run by CBN. We taught her how to cut and color hair, do manicures and pedicures. When the government said it was safe for Joan to return home, we gave Joan everything she needed to start salon. “I’m so happy I have new clothes. They fit well,” said Kurt with a grin.